You’ve no doubt heard the phrase “Practice Makes Perfect”; which is all well and good if the habit is desired; however, in reality, practice makes PERMANENT – which is not so great if it’s an unwanted habit. Fold your arms. You didn’t have to think about doing that did you? You just did it. However, if I asked you which arm was on top, without checking, you probably wouldn’t know. You have been so accustomed to folding your arms a certain way that it’s become a habit. The question is, was it a habit which was consciously made or unconsciously made? In this case, I suspect it’s the latter. So what, you might be thinking, it doesn’t really matter which way I fold my arms. That may be true in this case; however it’s not always so. Now try folding your arms the other way – unless you’re a very rare breed, I expect you found it awkward to do and somehow it just didn’t feel right, did it? Because you have folded your arms multiple times in the same way, it has become effortless. Such is the almighty power of repetition. Now think about all the tasks you do on a daily basis from showering, getting dressed, making a cup of tea to more complex matters such as driving and you will find that you also do these in a certain way, without consciously thinking. This is all fine and dandy when it comes to habits which are either good for you or neutral. The fact that you can do all these things so easily is beneficial because it saves you a lot of time and energy. Let’s be honest, though, some of your habits are destructive, whether they be a habitual mode of thinking, poor diet, too much alcohol, little exercise or even not charging what you’re worth! Yes of course you can. Is it easy? It depends on your definition of easy. It entails the same level of persistence required to create the unwanted habits. I have heard and read many times that it only takes 21 days to change a habit. So I decided to do a simple experiment on myself. I noticed I was in the bad habit of leaving the toothpaste cap off and the toothbrush (electric) on the basin instead of putting it back on its charger. I decided I wanted to change this habit and set to it. It took me a good 6 weeks to crack it for the most part and even now, very occasionally, I forget to do it. What I will say, though, is that at the beginning I had to work harder to do this and gradually it’s become easier. I don’t think I’m totally unconsciously competent yet, which means that I’m still having to think about it. My conclusion is that it takes quite a bit longer to correct a habit than I have been led to believe. Let’s cut to the chase then and create a strategy for changing habits which puts you in the driving seat. Decide what habit you want to change. Ask yourself on a scale of 1-10 how important it is for you to change that habit (with 1 being low and 10 being high). Providing your answer is 7 or above, you’ve got a good chance of changing it. You also need to make sure that it’s really your decision and not someone else’s. i.e. what’s the benefit? Take the new action consciously. Reward yourself in some way (but not with food or drink). If you lapse, merely correct yourself without beating yourself up. 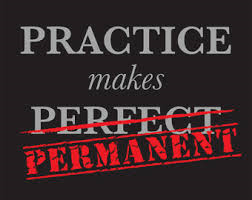 Keep practising until it becomes permanent. You can, of course, apply this process to any number of habits you want to change, one at a time. And, as always, if you know someone who might benefit from this article, please do share it with them – they won’t be mad at you for providing them with value. Promise!